Although Mario Castelnuovo-Tedesco described his musical Greeting Cards as a pastime, he continued to write them for 14 years, leaving a total of 52 works composed for various instruments. Now, the Greeting Cards he composed for guitar have been collected for the first time in a critical edition by Frédéric Zigante (Ricordi). The edition is available at Music Shop Europe. Two previously unpublished chamber music works written by Mario Castelnuovo-Tedesco during his American years are now available from Edizioni Curci. Published in collaboration with CIDIM – Comitato Nazionale Italiano Musica, the new editions are: the String Trio for violin, viola and cello, Opus 147, and the Third String Quartet, Opus 203. In 2015, the Castelnuovo-Tedesco family began working with Edizioni Curci with the goal of publishing previously unavailable works. With Maestro Angelo Gilardino as editor, The Castelnuovo-Tedesco Collection today includes eight previously unpublished and rarely, if ever, heard pieces, as well as the first biography of the composer (in Italian). Three chamber works recently published in this collection: The Concerto No. 3 op. 102 for violin and piano; String Trio op. 147; and the Sonata for violin and cello op. 148; have been brought to vivid life on a Naxos CD released this month. All three pieces were written by Castelnuovo-Tedesco in the decade following his emigration to the United States, and none have ever been recorded previously. On Saturday November 17, The Italian Academy for Advanced Studies in America at Columbia University will host a concert dedicated to the piano music of Mario Castelnuovo-Tedesco. Pianist and educator David Witten, whose international career has included concert tours in Europe, Israel, Asia, and South America, will perform works from his new CD, The Eclectic Piano Music of Mario Castelnuovo-Tedesco. This month, a world premiere recording by Francesca Dego and Francesca Leonardi of Mario Castelnuovo-Tedesco’s Ballade for violin and piano, Opus 107, gives this gem a second chance to shine in all its brilliance. Written in 1940 for the great violinist Tossy Spivakovsky, Ballade was one of the first pieces Castelnuovo-Tedesco wrote upon his arrival in the United States. Spivakovsky, himself a recent immigrant to the United States, premiered the work that same year at Carnegie Hall. Until 2018, it had literally never been heard again. Castelnuovo-Tedesco and his extensive body of work – from art songs to concertos to film scores and operas – are the subject of a profile in the October issue of London-based Opera magazine. 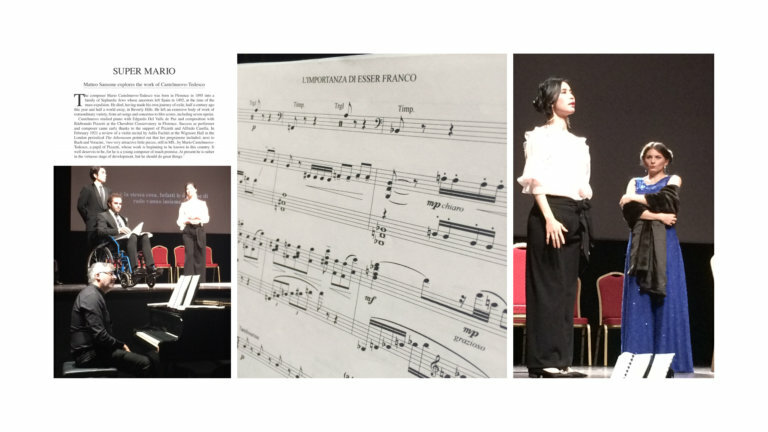 Highlighting the October production of the composer’s last opera, L’Importanza di Esser Franco (The Importance of Being Earnest) by the Conservatorio Cherubini in Florence, Prof. Matteo Sansone notes, “much else of his work remains ripe for rediscovery”. With a trove of new recordings released in 2018, some of Castelnuovo-Tedesco’s lesser-known works have emerged from the shadows. 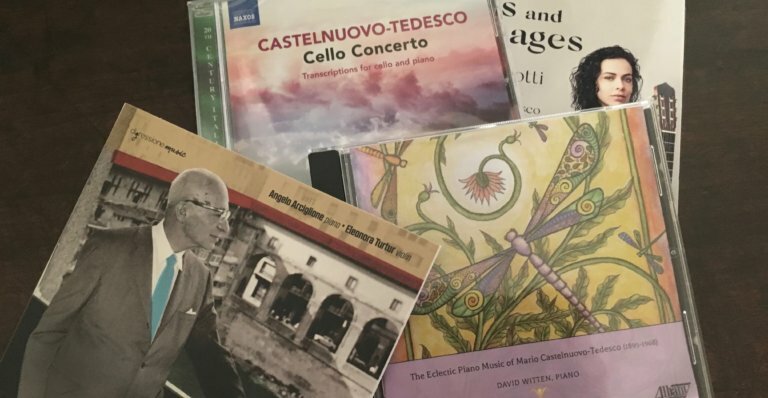 Thanks to the devoted research and passionate advocacy of musicians in the United States and in Italy, these CDs broaden our understanding of the composer’s musical production. More premiere recordings are expected in Fall 2018 and in 2019.